Why is it dangerous to register external employees in your corporate directory? External employees, having access, may be fired after a while. Of course, they will be deprived of access to the systems of their organization. But the account in your organization they have may remain, and they will continue to work in your systems. And what if these employees have moved to competitors? External employees will receive an additional account and one more password to remember. And there is no guarantee that they will treat this password as the main password in their organization. When you give the login and password (or even a smart card) to the employee of another organization, it seems to you that you control the process of access to the resources of your organization. In fact, it is nothing more than an illusion of control: employees of another organization will have access, and their behavior can be controlled only by specialists of the partner company (for example, administrators). 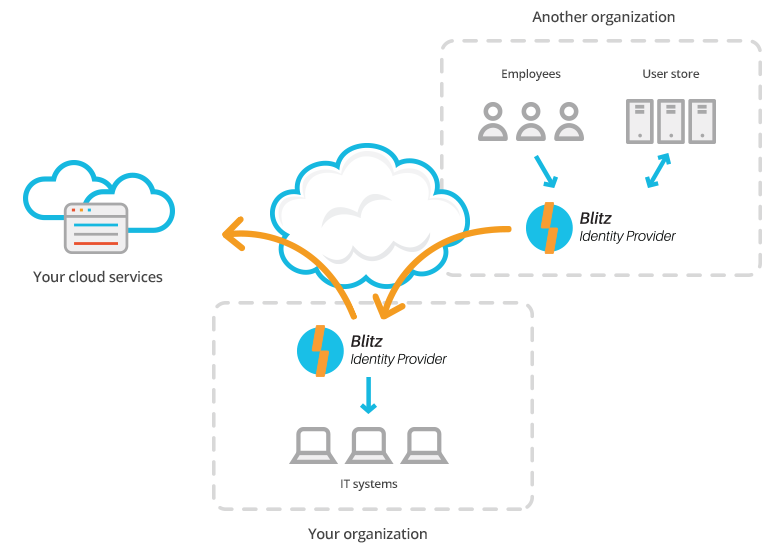 Create a trust network with partners company based on the Blitz Identity Provider — and you do not have to be afraid of unauthorized access to your applications. To do this, you need to install the Blitz Identity Provider in both companies — and then external employees using their corporate account, will be able to access the resources of your organization. If necessary, a corporate account of an employee of your organization can be used to access the applications of the partner company.